What will you do if you're far away from the Phils. and wanted to make pancit palabok with just the ingredients available in your local supermarket? That's the dilemna I had years ago when I had a hankering for a pancit palabok (aka pancit luglog) and the only Asian ingredients I can source out is the rice vermicelli and achuete (for the red colouring). Well, most of the ingredients like garlic, green onions, pork cracklings (chicharon), and shrimps are widely available so no problem with that. For the other key ingredients like tinapa - I substituted smoked mackerel; achuete - although I had this, you can substitute it with red food colouring; calamansi - use lemon or lime or combination. The only problem is the red sauce that is at the very heart of this dish. I ran out of those ready mix packets that is so common nowadays. I didn't want to make it from scratch, i.e., pound shrimp heads, squeeze out juice, thicken with cornstarch then redden with achuete, too tedious for me. My SIL, Ate Eva, from Toronto came to my rescue saying that they've been using condensed cream of mushroom soup in place of the red sauce for ages. She was right, it was a good substitute although it's obviously on the creamy side. Trust the ingenuity of hungry Pinays to come up with the goods no matter where they are in the world. So there I have it, all the ingredients for a pancit palabok. My next gripe would be the noodles. Or maybe lets discuss first the different names associated with this type of dish. Where I come from in Cavite, it's always called pancit luglog and almost always had the thin rice vermicelli - you know the kind that you use for the pancit guisado. The term 'luglog' would stem from the way the noodles are cooked or heated. 'Luglog' in Tagalog means 'to dip'. The tindera (vendor) would put a portion of the noodles in woven (bamboo?) elongated ladle-like tool then dip it for a few minutes in a big pot with continously boiling water or stock (for better taste). She would then put it in its eco-friendly packaging - cone-shaped wrapper of banana leaves and old newspapers. I don't know if it's peculiar to Cavite but the version there uses lots of sliced lip-puckeringly sour kalamias. I loved the the crunch and sourness it imbibes in my fav afternoon snack. As for the pancit palabok, it was only when I moved to the suburbs of Manila that I began hearing it referred to as such. What I saw was essentially the same but for the noodles which was noticeably thicker. The word 'palabok' literally means garnish, decoration or embellishments. So it refers to the numerous things you sprinkle on top of the red sauce. Now for the noodle gripe, I have no problem with the rice vermicelli but if you're going to serve this as a pre-mixed buffet dish it's best to use the thicker rice noodles so as to not make it too soggy while it's sitting there on the table. As of now, I haven't found a brand of thick noodles that I could say I'm satisfied with. All of the ones I tried takes about 25 minutes of boiling before it gets completely cooked. At that point it has disintegrated to 1-2 inch pieces and the water I boiled it in looked like those gawgaw mixtures my mother used to starch our clothes in! My sister told me that our aunt Ate Letty soaks her noodles first before boiling it. I did one time but still it broke up into pieces it did not hold its long strands (although it took less boiling this time.) Fortunately despite this limitation, the noodles is still completely edible though I would preferred it if the cooked strands are longer. Soak the rice noodles for several hours or overnight. Bring a potful of stock or water to boil. Drop the soaked rice noodles in it and cook until done. Soak the achuete in the hot water for at least 30 minutes. (Optional) Put 1 or 2 drops of lye water in it, stir to mix and soak for a few minutes more. Drain and reserve the water. Steam the fresh shrimps, cool, then peel them and set aside. If you're using dried shrimps - soak them in warm water for about 1 hour. Drain water and then set aside. Remove skin of the smoked fish and shred it. Dry fry (means no oil) or bake for a few minutes. Set aside. If using tofu, fry in oil until crispy. Set aside. Fry the minced garlic gently in oil. Drain from the oil and reserve both fried garlic and the oil used. Combine the cream of mushroom soup and achuete water in a saucepan. Cook gently while stirring. If the sauce is too thick add a little water at a time until it is about the consistency of yoghurt. Mix a portion of noodles with the red sauce, some garlic, pork crackling, spring onions, shrimps, and tofu. Add some lemon juice/patis mixture to taste. Transfer to the serving dish. Repeat the procedure until you have filled up your serving dish. 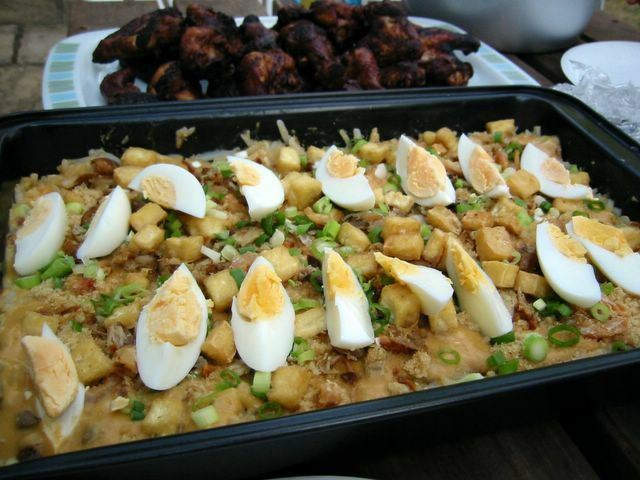 Spread a thin layer of the red sauce on top and garnish with garlic, pork crackling, spring onions, shrimps, tofu, then topped with hard boiled eggs. Serve lemon juice and patis on the side. After 100 hundred years of inactivity I am back! Blame the new job and the house move for keeping me just soo busy with no computer or internet connection for quite sometime. The stress of the move also put me off cooking new things and blogging about food. It was an email from Johanna inviting UK bloggers to some food/cooking events that had me salivating and spurred me on continuing my food blog. Needless to say I am keen in joining them especially in that Christmas market in Bath. Oooh how exciting! Less exciting is my growing discovery that this part of the West Midlands has been left out from the blessings of the patron saint of foodies. There is quite a dearth of good food markets, shops, delis or restaurants (except baltis). I think I will have to do the 45-minute drive to central Birmingham, Ludlow, Shropshire, and nearby counties to avail me of these. Though mind you, I haven't explored the farm shops that dot the rural areas near us. 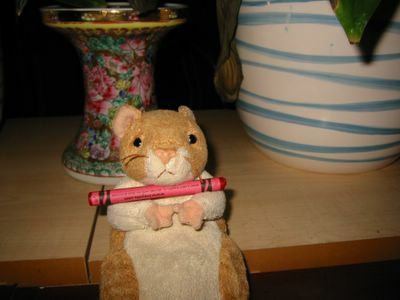 Not to worry, this all means that I'll just have to cook and bake more at home to make up for the shortage, isn't it? Always spot an opportunity in adverse conditions, that's what I say. So what's cooking now? Before we left our dear Surrey, our friends hosted a little potluck barbecue for us. 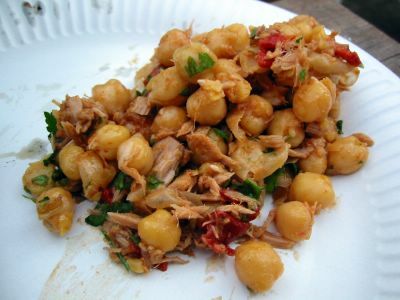 I've always been wanting to try this chickpea salad from Jenny of Pertelote (thanks Jenny!) ever since she brought it in our very first London food blogger soiree in Johanna's place last year. I did it the same as in her recipe except I changed the order of adding things with a plus in salt and black pepper as well. This is the first time I've worked with chickpeas (garbanzos in Spanish and Tagalog) and was quite fascinated the morning after soaking them to find that they've swelled up more than double its dried state. I was very tempted to remove the skins after cooking them but I have to add the vinegar and oil before it cools off completely. So I just let some of the skins remain for the sake of taste. One thing I have to say is don't skimp on spices like paprika because the chickpeas are quite bland and needs a lot of flavouring to balance it out. On a whole, this is great to have with some bread and of course the barbecued meats. 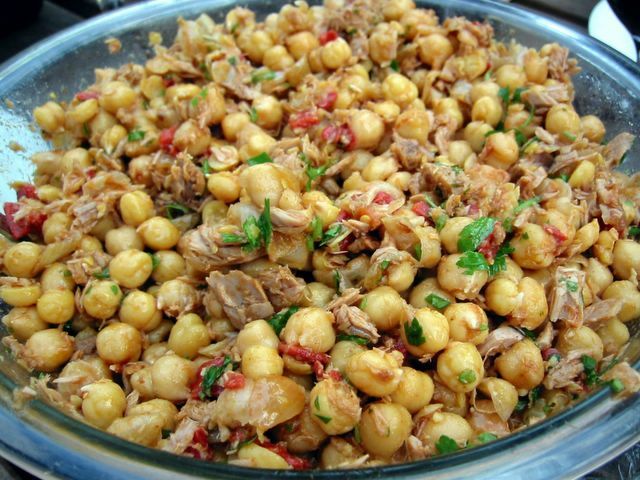 Put dry chickpeas in a bowl and cover with lots of cold water. Stir in bicarbonate of soda and leave to soak overnight. Next day, drain and rinse and drain again the chickpeas. Put in a pot, cover with water and bring to a boil. Reduce heat and simmer gently for about 1 hour and 30 minutes or until well cooked. While it's cooking, whisk the olive oil and vinegar in a small bowl, set aside. 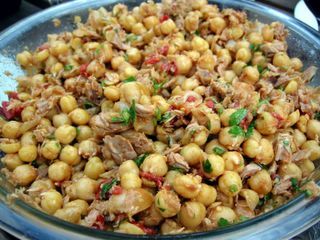 Once the chickpeas are cooked, immediately drain into a bowl and mix in the vinegar mixture while still warm. Add in the roasted pepper, salt and black pepper. Set aside. Fry the onions gently until soft and translucent. Add the cumin, fennel, chilli, and half the paprika. Set aside. You can do things up to this point and keep in the fridge until half an hour before serving. Before serving, mix everything in a big bowl including the parsley and the rest of the paprika. Take care in mixing so as not to break up the tuna too much. Serve as part of buffet or with bread.